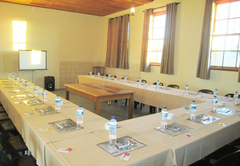 Truksvy B&B and Koffie Sjop is a highly recommended B&B with self catering option, providing accommodation in Soutpan for tourists visiting the Lejweleputswa region. 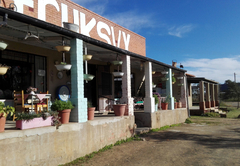 Truksvy B&B and Koffie Sjop is a small restaurant and accommodation establishment operating in the Free State town Soutpan, where salt has been mined since the 1800's. Here you can enjoy the peace and quiet while enjoying the most wonderful views of the Milky Way at night. 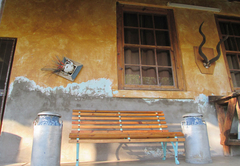 Accomodation is next to the 'Koffie Sjop'. Ideal for small families. 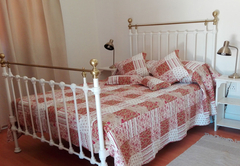 It has a living area, a kitchenette, a double bed and 3 single beds. It is fitted with a fan, a heater, a fridge, a kettle. The bathroom has a shower only. 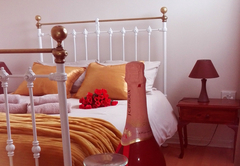 Features: Double bed, shower only, balcony / patio, single beds, garden views, fan, heater, bar fridge. This is our Backpackers unit. This was used as the butchery / tuisnywerheid up to the early 80’s. Truksvy being the bigger room and facing the road, has a room with a double bed, kitchenette with basin, fan, heater, fridge, TV, kettle and hospitality tray. the bathroom has a shower only. Being the back room and facing the field has a double bed and kitchenette. It is fitted with a fan, air-conditioner, fridge, Satelite TV, kettle, hospitality tray. The bathroom has a shower only. 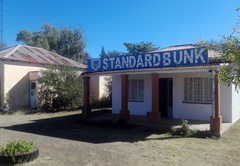 This was used as the butchery up to the early 80's. Breakfast can be added, all other meals, wood etc must be ordered. 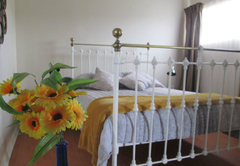 Feature: Double bed, OVHD, En-suite, patio, garden views, tea / coffee making facilities, Bar Fridge, No Smoking in Room, BBQ area. We have a coffee shop for buying products that may have been forgotten or lost. Clean towels available for use by guests. Daily cleaning of the room is included. 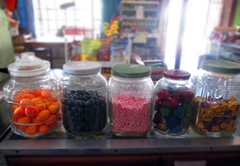 Walk back in time when you have a coffee at the Truksvy Koffie Sjop with its glass showcases, hand operated till, pound scale, sweets in glass jars and pictures of people and places long gone on the walls! 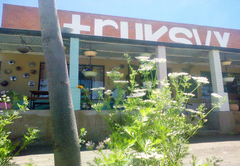 Breakfast is available at Truksvy Koffie Sjop. A menu is also available from Tuesday to Sunday morning for light meals. Truksvy is known for its Sunday lunches. 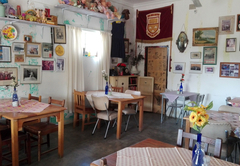 We have a traditional 'Boerekos' buffet; freshly baked bread with butter and homemade jam, oxtail, chicken pie, samp, two vegtables, potatoes, salad and desert. Please book in advance. We also do buffet style breakfasts for groups where we give a farmstyle breakfast with boeretroos, eggs, mince, ‘pap en sous’, homemade bread. Each room has a menu if you want room service. 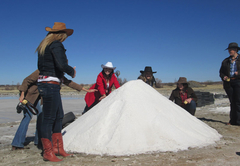 Salt tours can be arranged - you will be taken to a working salt mine. Krona will tell you in her own unique style more about why there is salt in the middle of the country, how it was discovered, the way salt was mined in earlier years and how salt is mined on such a small scale today. You will have time to ask questions and taste some of the local ‘windpomp’ sherry. This tour can also be done by donkey cart. 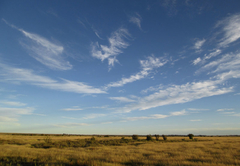 • Bloemfontein is 45km from Soutpan. Child policyChildren of all ages are welcome in our Backpackers. Late check-in by arrangement only.